Social media is changing all aspects of B2B sales and marketing from attracting, engaging and redefining the way sales organizations prospect clients. What does it take for social media to prove ROI in complex business to business environments? Join Heidi Thorne, of Thorne Communications LLC, as she discusses the latest thinking, trends, platforms and steps to becoming a truly social business even in the B2B marketplace. While she cringes at the idea of being called a social media expert, Heidi has been able to leverage her social media activities to create new sales, networking and public relations opportunities for her company which primarily serves B2B clients. Her presentation will focus on practical tips and strategies for making your social media activities more productive. She brings over 25 years of experience in the fields of advertising, marketing, sales and public relations to this program, including a decade in the trade show and hospitality industries. 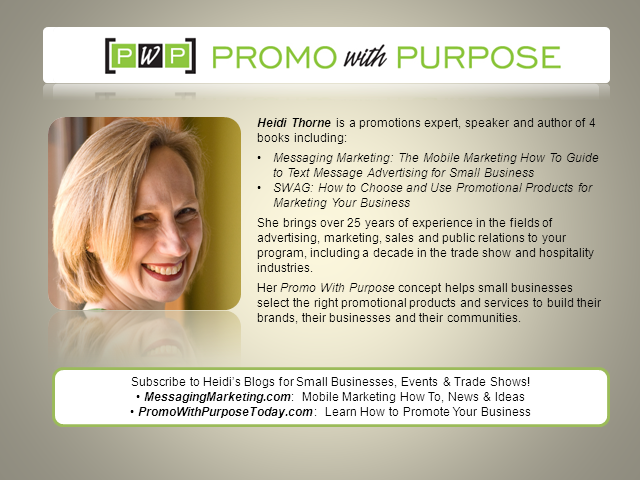 Heidi is also the editor and founder of PromoWithPurposeToday.com (tips on how to promote your company) and MessagingMarketing.com (mobile marketing how to) blogs.